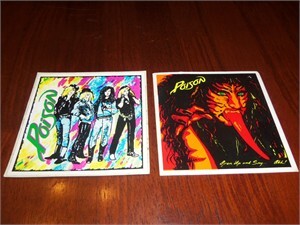 Two different 4 by 4 inch square Poison stickers or decals with textured surfaces: Open Up And Say . . . Ahh! and colorful artwork of the four members. ONLY ONE SET AVAILABLE FOR SALE.